As the B842 wends its way up the east coast of the Kintyre peninsula from Campbeltown to Carradale, an especially sharp twist and a steep descent bring you down into the tiny hamlet of Saddell. A signpost points out the car park for Saddell Abbey, and another leads you, this time on foot, the short distance to what is left of the abbey. Not a great deal actually remains of Saddell Abbey itself. Standing amongst a graveyard are a cluster of stone walls that are difficult to set in context. These are all that remains of the north transept and choir of the abbey church. Nothing is left of the much larger nave and the south transept of the church. And almost nothing remains of the square of buildings surrounding a cloister that once stood to the south of the abbey church. The exception is a low oblong of stone walls almost lost in the encroaching woodland which once formed part of the refectory and undercroft. 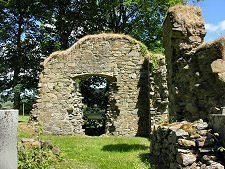 The rest of the abbey has, presumably, been recycled into later buildings erected in Saddell such as Saddell Castle and Saddell House. 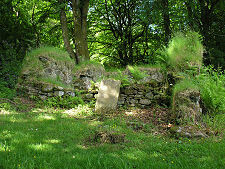 What remains seems to have been allowed to do so as enclosures for later burials on the site. If this was all that remained of Saddell Abbey, it would still be worth stopping to see. But in many ways the main attraction of the abbey is not what still stands of the structure itself. Instead it is the truly remarkable collection of late medieval grave slabs and effigies that marked burials here during the active life of the abbey, and which are now protected from the elements in a purpose-built shelter at the car park end of the site. 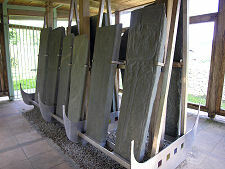 There are twelve of these stones on show at Saddell, dating back to the 1300s or 1400s. 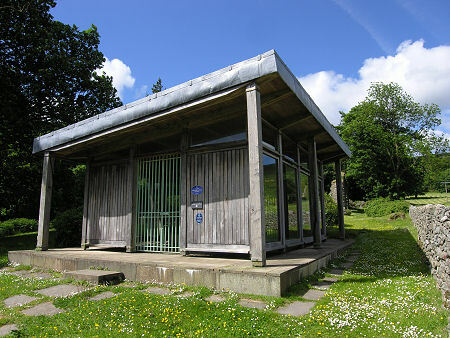 Ten are displayed in back to back displays along the centre of the shelter. The most immediately striking are the five carrying carved figures depicting the people whose graves they originally marked: effigies. Two of these seem to have been priests, though one is now headless. The other three are magnificent West Highland lords in full armour. One of these is depicted with a retainer unfastening his spurs and a figure over his left shoulder which may indicated that his wife was buried alongside him. 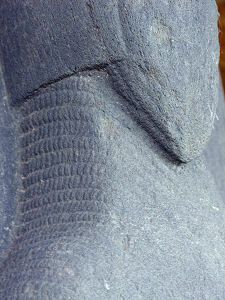 The central figure commemorates a giant of a man, whose armour remains remarkably detailed after all these centuries. Less obvious today is the inscription above his right shoulder which suggests the effigy commemorates one Neil McNair and was commissioned by his son Donald. 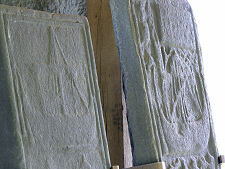 The five grave slabs on the other side of the display are less immediately striking, but no less beautifully detailed. Two of the markers carry depictions of west highland galleys, while several carry the much more common long sword indicating the burial of a knight. 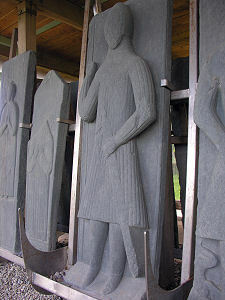 It is thought that the slabs on show, and one of the effigies, belong to what is called the "Kintyre School" of medieval carving, and it seems highly likely that this school, which produced grave slabs found the length of Kintyre and Knapdale, was located here at Saddell Abbey. 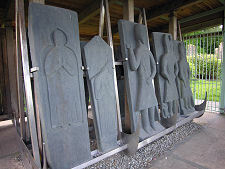 It seems equally clear, however, that the four largest effigies were carved on Iona, and the similarities with some of those on display in the Iona Infirmary Museum are undisputable. Two other stones are also on display. 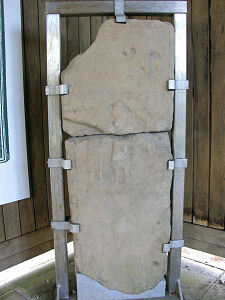 One is part of a standing cross, while another is a grave slab that was found in modern times in the undercroft beneath the refectory of the abbey. It is made of a completely different stone to all the others on show. 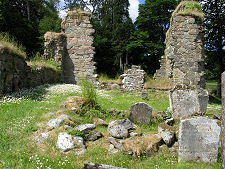 The story of Saddell Abbey began in the 1140s when Bishop Malachy of Armagh came to Kintyre to seek out a suitable site for a Cistercian monastery. Saddell seemed to offer the perfect location, and land was granted by Somerled, at the time a powerful noble in Kintyre. Building of the abbey began in 1148, and monks came to Saddell from the Cistercian Abbey at Mellifont in County Armagh, Ireland. Somerled proved a powerful benefactor, all the more so when in 1158 he freed the Highlands and Islands from Norse rule and proclaimed himself Ri Innse Gall or King of the Isles. 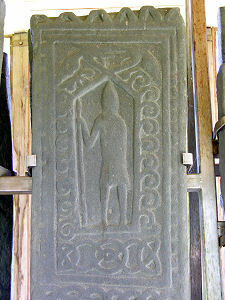 Somerled was killed at Renfrew in 1164 and there is an enduring clan tradition that his body was brought to Saddell for burial in the south wall of the choir of the church: though others sources say he was buried on Iona. Somerled's son Raghnall, or Reginald, re-endowed the abbey in 1160 and it seems to have continued in being for a further three and a half largely unrecorded centuries. The end probably came in the years after 1493. That was the year in which James IV finally gave up on his hopes to control the western seaboard of Scotland through a subservient Lord of the Isles and took personal control of the title. 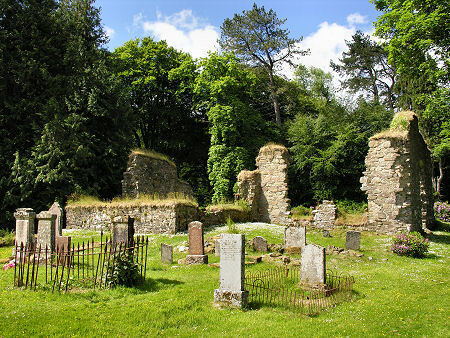 There was later some debate about whether the seat of the Bishop of Argyll should move to Saddell from Lismore, but this seems to have come to nothing, and Saddell Abbey was allowed to subside into ruin, leaving just fragmentary remains and the powerful, haunting, effigies of some of those who were buried here to show how important this place once was.